Hickory, NC- The Hickory Crawdads beat the Kannapolis Intimidators 6-1 in Thursday's Home Opener. 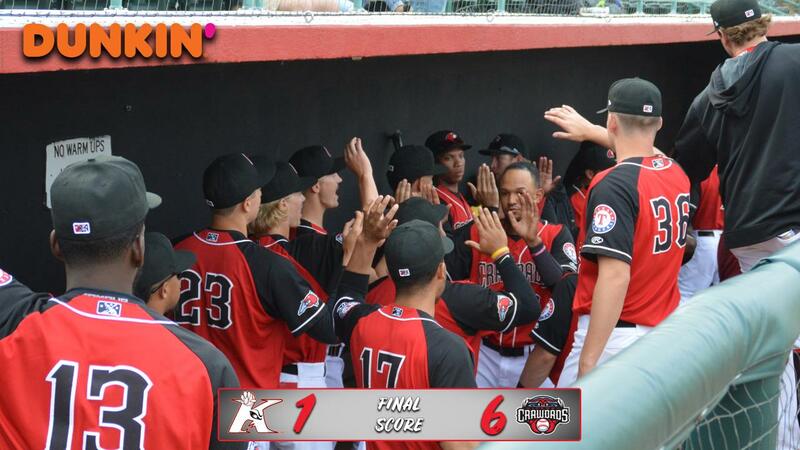 The 'Dads racked up 17 strikeouts, tying a team record for a nine inning game. Starter Jake Latz struck out eight batters across five innings. Tai Tiedemann struck out five in two innings while Nick Snyder finished things off with four punch outs in two innings. Miguel Aparicio got the 'Dads on the board in the bottom of the fifth inning with a double that tied the game at one. Frainyer Chavez followed up with a two run single. Chris Seise reached on a single but was picked off trying to steal second. Seise was able to extend the rundown long enough for Chavez to score from third to put the 'Dads up 4-0. Sam Huff and Pedro Gonzalez hit back-to-back homeruns in the bottom half of the sixth to extend the lead to five. The homestand continues tomorrow evening with Roaring '20s Night and a post-game fireworks show. The game will also be the first Arby's Reading Program night of the season and students who completed the program can redeem their bookmarks for up to four free tickets. First pitch is at 7pm and gates will open at 6pm.